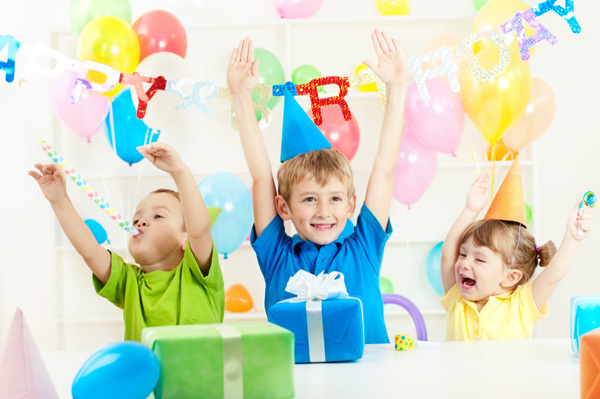 Most parents look forward to their children’s birthday parties with a certain amount of trepidation, mostly because of their concern about how to keep 10 small people happily occupied for two or more hours. Forward planning is always key, but aside from the more obvious areas such as time, place, food and theme, the type of games that are played is often paramount to the success of a birthday party. counting etc. It also means the number of tears shed would be minimized, that no child would feel eliminated and that everyone would win a prize. the more well-known games, but how about playing these with an added twist? such as a shape sorter, in the center and ask the child who is holding the parcel when the music stops, to put in a shape of their choice. The possibilities are endless! younger child could simply be asked to count to 10 or touch the end of their nose with their eyes closed. Some of the more creative games I have come across include variations of the Memory Game, Toy Walk, Through the Hole, Chain and Chinese Whispers. When selecting a theme or devising party games, it is important not only to take the child’s age into account but, where possible, to identify the dominant interests of the invitees. play games such as Kangaroo, which involves the children jumping a certain distance with an object between their knees, such as a soft animal toy. competition, which most young children love. avoid the worst case scenario of the entertainer not living up to their classified ad, or using material that is inappropriate for very young children. It is also important to remember that some children are scared by certain costumes. To avoid this, you could request that the entertainer puts on his or her attire whilst the children watch.